Super Street Fighter II: The New Challengers (スーパーストリートファイターⅡ) is a head-to-head fighting game produced by Capcom originally released as a coin-operated arcade game in 1993. 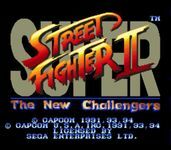 It is the fourth arcade version of Street Fighter II produced, following the original Street Fighter II, Street Fighter II: Champion Edition and Street Fighter II Turbo: Hyper Fighting. In addition to refining and balancing the existing character roster from the previous installments, Super Street Fighter II also introduced four new characters. It was also the first game to be developed on Capcom's CP System II hardware, which permitted more sophisticated graphics and audio over the original CP System hardware, used by the previous versions of Street Fighter II. Super Street Fighter II Turbo: Balance issues, and the addition of the "Super" meter. While important to the seasoned SFII player, these differences are very marginal for the scope of the database. Super Street Fighter II X/Super Street Fighter II X for Matching Service: This version of the game, among balance adjustments, introduced the "Super Move" meter, that charge as the player plays, and can then allow the use of a special super move that does a lot of damage, and also introduced the character Gouki (called Akuma in the west). Super Street Fighter II Turbo HD Remix: HD graphics remaster. Ultra Street Fighter II: HD graphics remaster.